Photo: WmJR/Flickr Biltong: South Africa is home to biltong, a cured, dried meat snack ranging from high quality cuts of beef to ostrich and local game. It's common enough to find in a supermarket, but you'll also find it in specialty shops. Photo: Werner BayerFlickr Art: Most South African art follows or finds inspiration in indigenous motifs and the country's tumultuous history. Art abounds at markets, but larger cities, especially Cape Town and Johannesburg, are rich with galleries. Photo: Hoberman Collection /Getty Fashion: As with its art, South African fashion is influenced by a rich cultural history. Cities like Cape Town, Johannesburg, Pretoria and Stellenbosch are lush with boutiques, and clothing and accessories are easy to find at craft markets. Photo: A Girl With Tea/Flickr Roobios tea: Roobios, a bush native to South Africa's Cederberg region, has been harvested to make tea for centuries. Roobios tea still remains a quintessential South African drink and can be found at supermarkets as well as specialty shops. Photo: José Carlos Babo /Flickr Crafts: South Africa brims with crafts made from a variety of mediums: wood, leather, beads, even recycled materials. Follow craft routes around the country and explore Cape Town's for incredible finds. Photo by Wolfgang Kaehler/LightRocket via Getty Images Wine: South Africa is an established wine destination, with centuries of experience and brimming vineyards. After tasting and touring at least one vineyard, buy a few bottles to take back home. 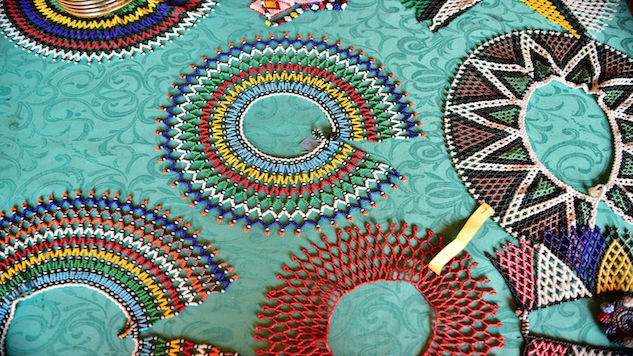 Photo by South African Tourism, CC-BY Crafts: South Africa brims with crafts made from a variety of mediums: wood, leather, beads, even recycled materials. Follow craft routes around the country and explore Cape Town's for incredible finds. Photo: rob_rob2001, CC-BY Amarula: Amarula, a creamy after-dinner liqueur made from the indigenous marula tree, is the quintessential South African nightcap. Bring it back from a package store or duty-free shop and serve it poured over ice. Few countries can boast a spread of wonders as extensive as South Africa’s. The country’s conglomeration of cultures, astounding biological and geographic diversity and vibrant artistic spirit make it a standout (and unforgettable) destination. It only makes sense, then, that the treasures you bring home celebrate both its land and its people’s identities. Because South Africa is a meshed nation, its art, crafts and are a cultural conversation. Additionally, South Africa has plenty to offer drink wise—incredible wineries, a centuries-long tradition of brewing tea with native plants and Amarula, an indulgent after-dinner sipper. For a more portable souvenir, bring home strips of biltong, a quintessential South African snack.